Australia’s climate policy just got even worse. Last year when the Multi-Party Climate Change Committee agreed a carbon price, they also agreed a number of complementary measures, many arguably better than the carbon price itself. One of them was a floor price; it was scrapped last week. Another was that the Government would pay electricity generators a negotiated amount to close 2,000 MW of coal power – so-called “contracts for closure”. Guess what? Now it’s gone too. Contracts for closure were supposed to be completed by June, but generators failed to accept the amount the Government was offering, so now the policy has been cancelled entirely. Energy Minister Martin Ferguson, announcing the cancellation of the policy, said “the companies themselves will make their own commercial decisions as to their future over time.” Allowing the coal industry to decide the future of the coal industry will not address global warming. The generators claim they are still profitable despite the carbon tax. This is a further demonstration (in addition to those I covered yesterday) of just how ineffective the carbon price is. In particular, it has to do with the $1 billion per year that coal-fired generators which continue to operate will get in “compensation”, supposedly to protect “energy security”. This ludicrous compensation, which the Greens should never have agreed to, effectively keeps coal-fired generation profitable and locks in its continued existence for years. 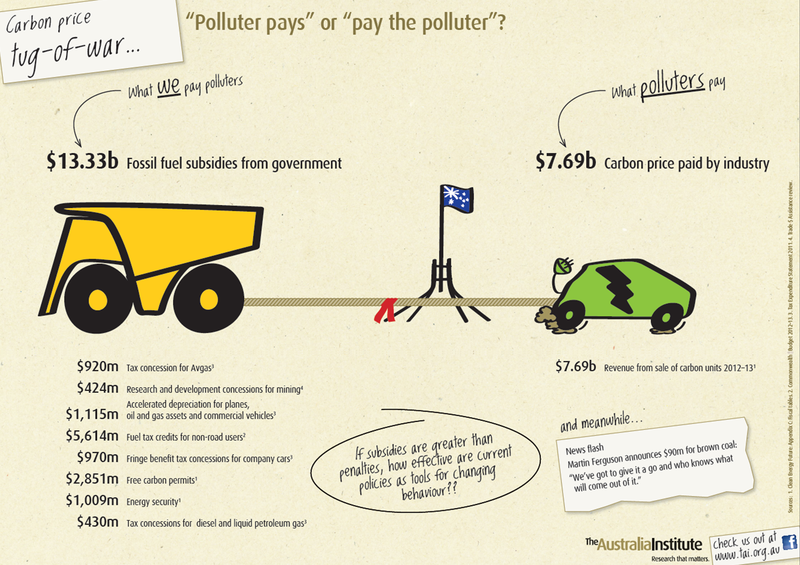 It is just one example of many fossil fuel subsidies on which Australian taxpayers spend $13 billion annually, outweighing the $8 billion revenue raised by the carbon price. It’s the sort of thing you’d expect to have free market advocates up in arms; their silence on the issue betrays a double standard. There is a silver lining: it is possible that something good may come out of this latest backflip. Greens leader Christine Milne says she will move immediately for the Productivity Commission to review the generators’ compensation, and that the Greens will “use every political and parliamentary lever we can to speed up the transition to a clean energy economy.” That’s stronger rhetoric than we’ve heard from the Greens for a while. Could it mean the Greens will finally get back on the front foot? According to a new analysis by Frontier Economics, coal-fired generators have been overcompensated for the carbon price, increasing their profitability by up to $1 billion. This is partly due to the recent agreement to link to the EU ETS and not implement a planned carbon floor price. All this reinforces what should have been obvious: the Multi-Party Climate Change Committee should never have decided to shower coal power plants with compensation. The Government cannot pay polluters to close while also paying them to stay open. Of the money allocated for coal power compensation $1 billion has already been spent, but the remaining $4.5 billion should be immediately cancelled and instead put into renewable energy. I encourage concerned readers to sign this petition.